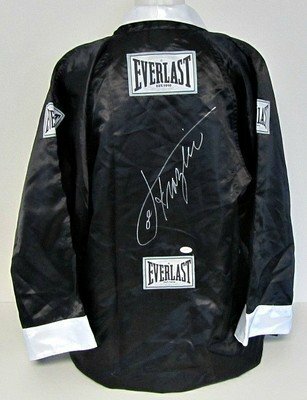 Featured is a signed Joe Frazier Black Everlast Full-Length Boxing Robe. This robe was hand-signed by Frazier and includes a JSA hologram. Joe Frazier, known as “Smokin’ Joe,” was an Olympic and Undisputed World Heavyweight boxing champion. He passed away on 11/7/2011.